One of the world's rarest big cats was recently discovered inhabiting a region of China it had never been seen in before. But instead of being spotted on a remote camera trap, as is often the case with such elusive species, this new arrival made his presence be known in a manner worthy of the big screen. Fishermen Zhang Mingyu and his brother were transporting supplies on the Ussuri River in the northwestern province of Heilongjiang when he spotted a large animal swimming towards them. The area is home to the Sanjiang Nature Reserve, so encounters with wildlife aren't so uncommon -- but this one was. "I was standing on the boat, looking at the animal without knowing what it was," says Mingyu. "The animal turned around its head and roared at us. It was frightening as it sounded like a tiger. It really scared me." The animal, as it turns out, was indeed an endangered Siberian tiger -- and things were about to get a bit more frightening. "The tiger swam nearer and put its claws on our boat, and I was so scared by the move that I ran to the stern. My brother said we shouldn't let the tiger onto the boat, so we pushed it back into water, with a pole." Eventually, the tiger got the message and abandoned his attempt to board the boat. As it swam away towards the shore, one of the men was able to capture evidence of their close-encounter on their cellphone camera. 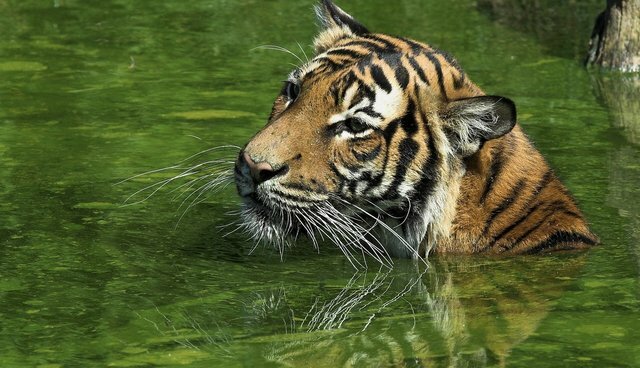 Wildlife officials who reviewed the footage and later found footprints along the shore have confirmed that the cat is indeed a Siberian tiger, the first one to be spotted in the region -- though, with any luck, it won't be the last. "Thanks to the natural environment here, there are abundant wild animals such as hare and roe deer, the food of the wild tiger. The reserve has become a paradise for the rare beast," Sanjiang Nature Reserve's press officer Wu Zhifu told news site Xinhua. There are believed to be as few as 500 Siberian tigers left in the wild, with less than two dozen of those living in China.